As you’ve probably guessed by now, I’m not much of a “Woo-Woo” person. I don’t listen to Phish, I haven’t owned tye-die since 1991, I don’t believe in Dream Catchers or Fortune Tellers, and I generally find activities where you’re supposed to close your eyes and hold hands with your neighbor somewhat amusing, and very uncomfortable. This translates itself in perfect form into the kitchen as I suspiciously flip through recipes exclaiming “Delicious Sprout Smoothies” or “Dairy Free Grilled Cheese”. If I can’t see something, and taste it, and touch it, and most importantly, make sense of it, I tend to be a bit of a skeptic. Okay…a really big, annoying skeptic. So when my CSA box arrived boasting a Cauliflower Mac & Cheese I was immediately wary, quick to dub it as some vegetarian, hippy dish that would never be as good as the real thing. However, as I peered into my refrigerator and realized that I still had anxiety-producing amounts of vegetables left and no plan with how to tackle them I decided to hand myself over to the softer side, and give this a try. 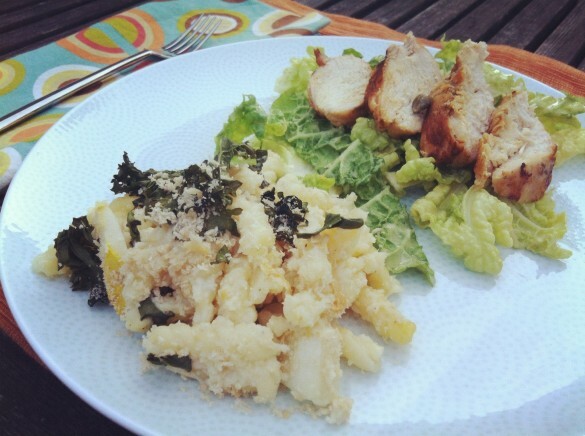 It admittedly is not the same dish as a traditional Mac & Cheese made with a béchamel, lots of cheese, and heavy cream, but it is a lovely lighter version of the old standard, with a nice contrast between the creamy cauliflower puree, dark, leafy kale, and crispy panko bread crumbs. It also is delicious, I think maybe even better, microwaved the next day…go figure! Enjoy this when you’re willing to put your cynic subconscious on the shelf for an evening, and see what emerges. The treats, in order of when comments were made. The judges preparing for their case. GIVEAWAY WINNER: Thanks to all who entered to win tickets to the Best of Seattle Party! The honorable judges, Duke and Lou chose the winner out of a row of 11 treats. The first snarfed up was #8, Morgen Schuler of Morgen Schuler Photography. Congrats to Morgan…and lucky for us, now we know this year’s event will be shot in style! Little Lou, a fair and unbiased judge. The secret ingredient…a spoonful of low-fat plain yogurt. Erina vs. The Veggies…my ongoing summer battle. Cook cauliflower in boiling water for 25 minutes or until very tender. Drain out all water, and add to cauliflower the stock (discard bay leaves), cheese, yogurt, oil, mustard, nutmeg, salt and pepper. Using an immersion blender, puree until totally smooth. Meanwhile, boil a second pot of water and cook the pasta, 3 minutes less than instructions. Drain and rinse with cool water. Add the pasta to the cauliflower puree and mix well. Pour half the pasta into the prepared dish. Top with half the kale and squash. Pour the remaining in and add the kale and squash. Top with parmesan and panko bread crumbs. Bake 20 minutes or until breadcrumbs are turning golden brown. Allow to sit 5-10 minutes before serving. Haha…thanks Emmy! I surprised myself on this one…even my cynical self had to admit it was damn tasty. Just don’t tell him! 🙂 Thanks for stopping by! What a great way to make mac & cheese a little healthier! It looks delicious. Thanks Pam! Glad that it piqued your interest. Hope you had a great trip…excited to see what’ll be coming out of your kitchen in the coming weeks. Wow, I’m always looking for a “healthy” mac-and-cheese and am blown away by the idea of using pureed cauliflower as the sauce. Sheer genius. alterations! When woo-woo wafts around. Did I mention it makes a HUGE dent in the CSA box?!? they are pretty precious, aren’t they? I was just wine tasting this past weekend with some girl friends and upon returning home I’d swear Lou is even bigger!